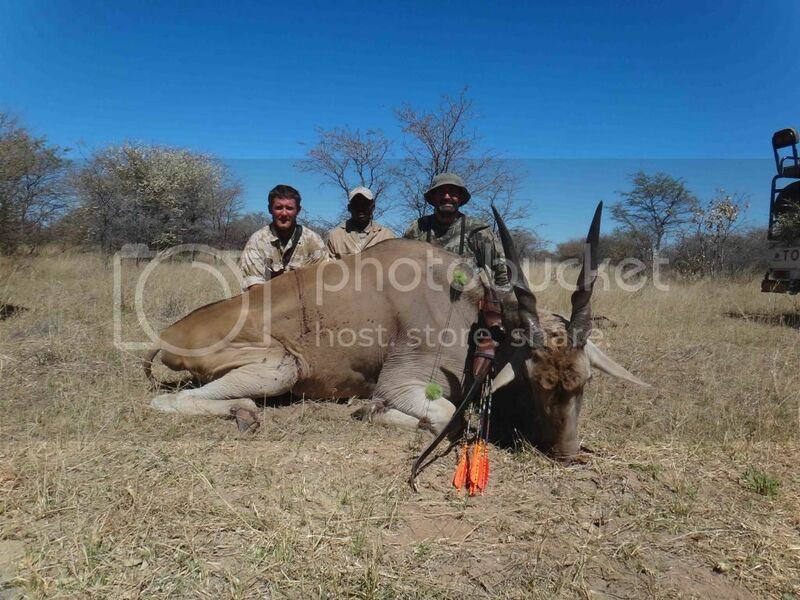 I am back from south western Botswana where we bow hunted with 2 friends for 8 hunting days. 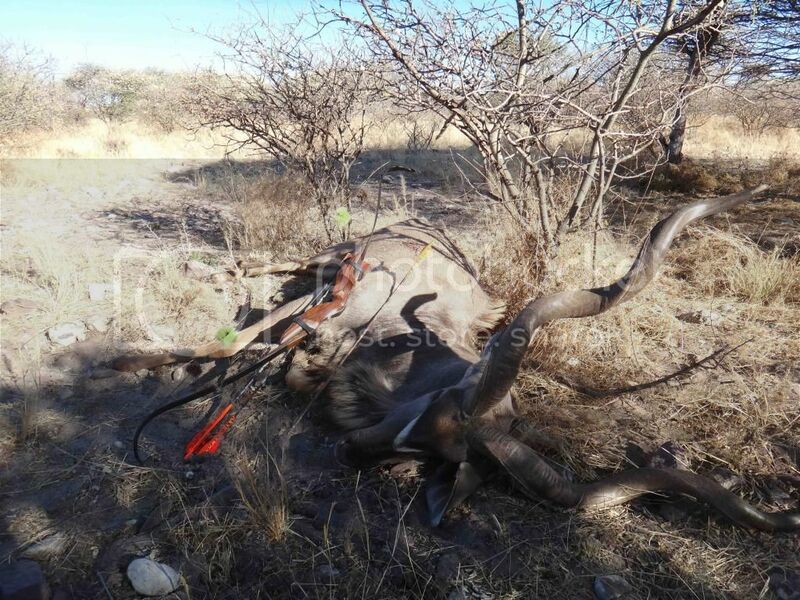 National parks hunting is no more legal in Botswana but private lands hunting can be done. Compared to South Africa, rates are a tad higher and going there is longer with no direct airways. 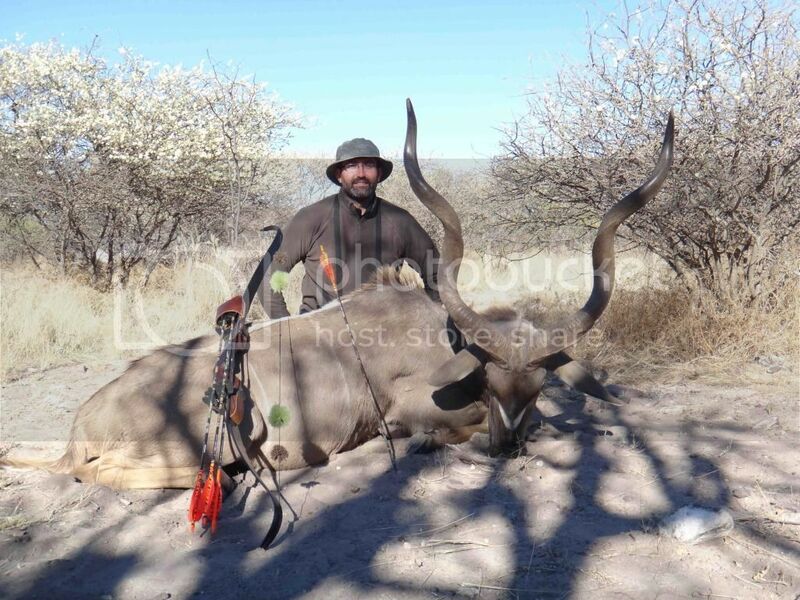 Hunting properties are not bow only and you will share camp with rifle hunters. But hunting place are huge : we hunted 2 properties: 75 000 acres and 100 000 acres. Regarding to animal density, the place we were wasn't brought to his max potential with medium to low animal density. 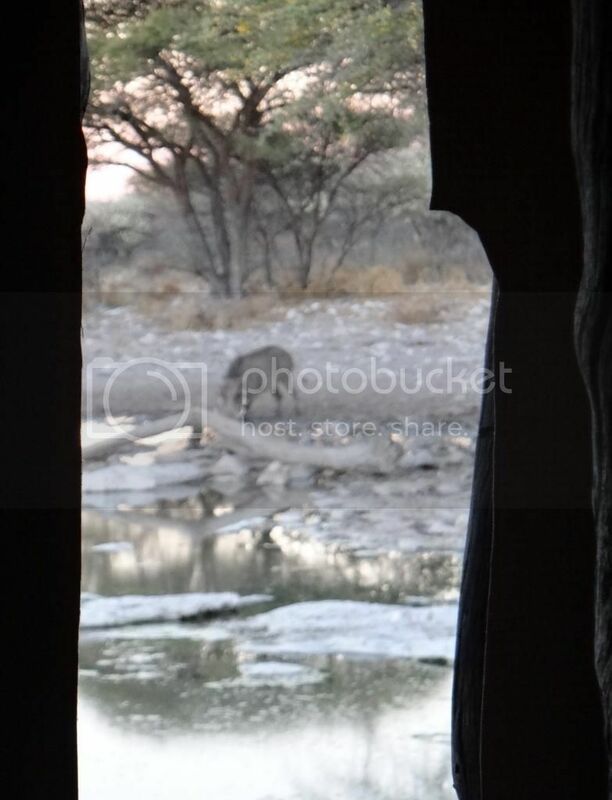 Bowhunting takes places in natural waterholes helped by solar pump during dry season or out of the blind, chasing the game in the thorn bush. 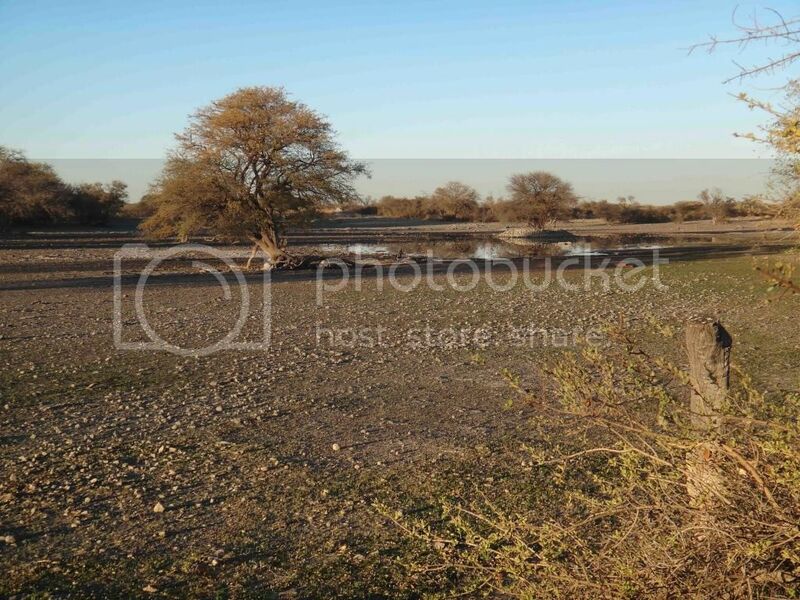 There is absolutely no feeders, nor covered or pumped back water during night ( in order to dry the waterholes to get all animals during day...) as you may found in some places in South Africa. 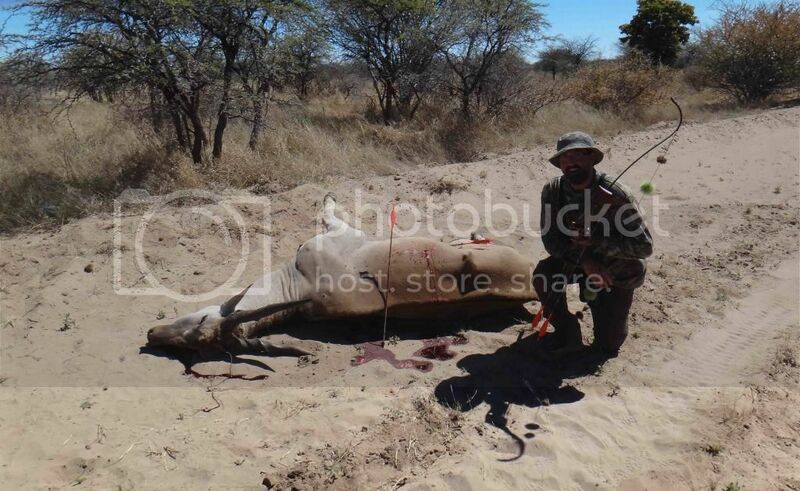 Conditions are tough and for each animal you must hunt hard, as you will not see crowded waterholes with 0 to 4 animals for a whole day in the blinds, with few big trophies coming at the far side, mostly quartering toward. We knew that shooting range might be longer than our usual so I made a " light" arrow for that hunt that indeed worked very well. I shot my border black Douglas HEX6.5 custom tillered, 64" and 61# @ 31"
30 minutes before last light, a couple of wildebeest cows came, at the furthest part of a muddy waterhole, steep quartering toward. The PH range them 20 yards. I thought I could get a better angle when they would turn to go back to the bush but they decided to go straight toward us around the hide. Pressure was really high as it was now or never. At this time all I could see was through a lateral narrow window of the hide, 25 yards away, but with perfect broadside view. The first young cow went without stopping and once I saw the second one, mature cow, I decided it was poker time, through that narrow window: the cow stopped with a little call broadside and all I remember is an orange butterfly disappearing in the chest of the cow, with complete pass through arrow. 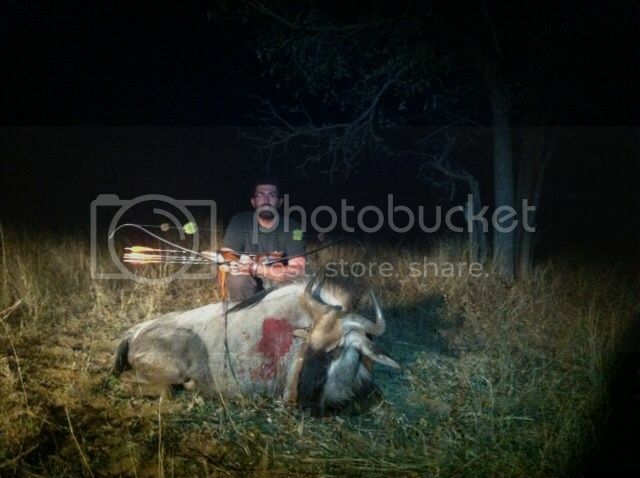 After a 20 minutes wait we decided to track the wildebeest cow as night was coming. We found her dead 120 yards away, following a fair bloody trail. On day 2 nothing happened and the wind was very bad, swirling all the time. 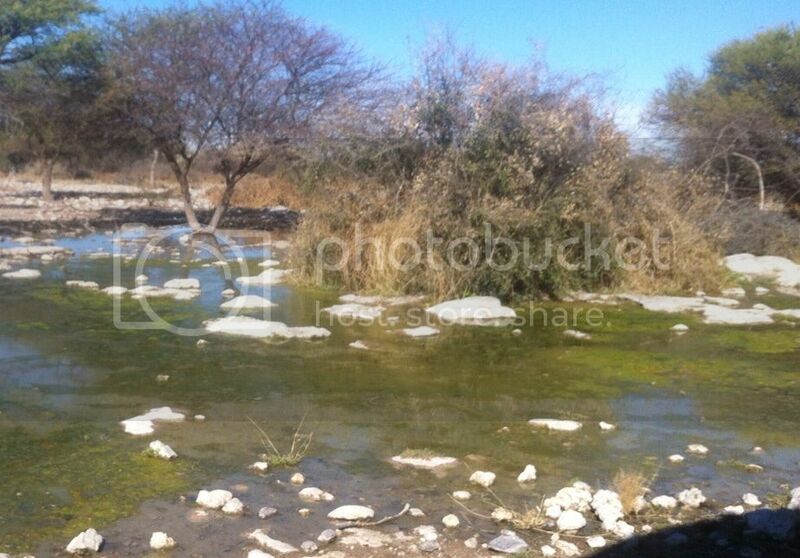 We spent all afternoon outside of the hide trying to stalk but we only saw a couple of oryx, very skittish. On day 3 we headed northern on a second property neighboring ours. Bush was much smaller and less thick. After almost an hours drive we arrived at a tiny waterhole with a pit blind, but furthest part of the water was only 17 yards, giving me some hope I could get an easier shot than the previous. 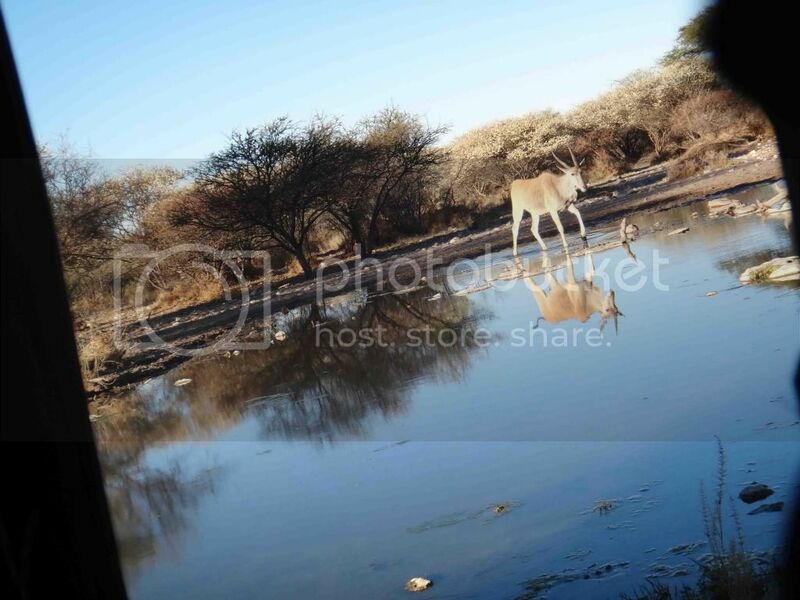 Few minutes before noon time a female oryx came alone, very skittish. She waited 20 minutes before slowly coming, looking around to the bush very closely. She came quartering toward, 11 yards away. I thought I could get a shot while turning to go back but once she finished drinking, she flipped quickly and went away walking in a second. So fast that I never could get a shot...I was depressed !! 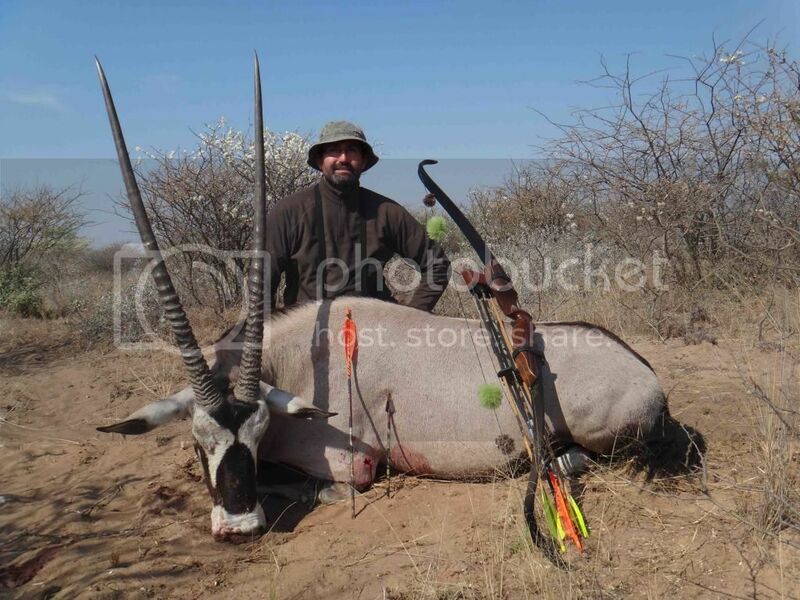 A monster oryx came, quartering toward, 15 yards. I was so motivated and learned the morning lesson. I took the shot quartering toward, focusing a point between neck and shoulder blade. My arrow went spot on and we could see a wide spread of blood at impact. Bull ran 80 yards and then disappeared in the bush, out of sight. All happened so fast and with so high pressure that I started to shake, LoL !! 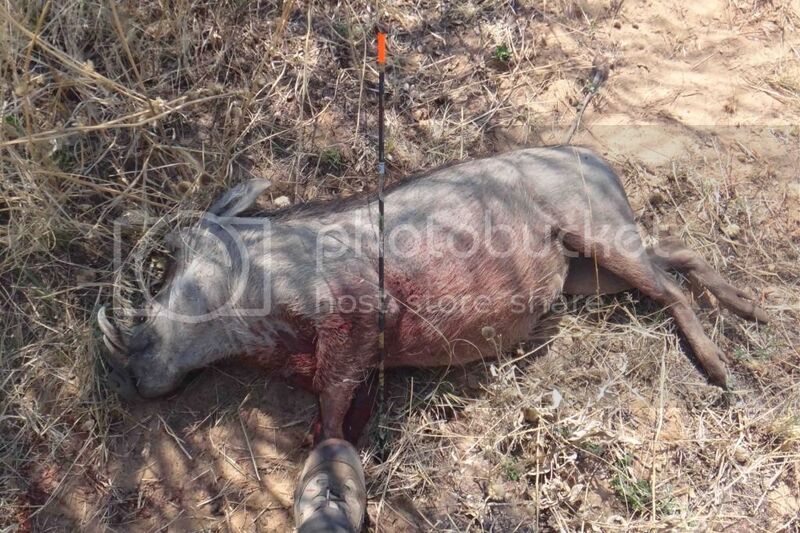 After 20 minutes we trailed very easily the bull and found him dead 20 yards away from the point he disappeared. 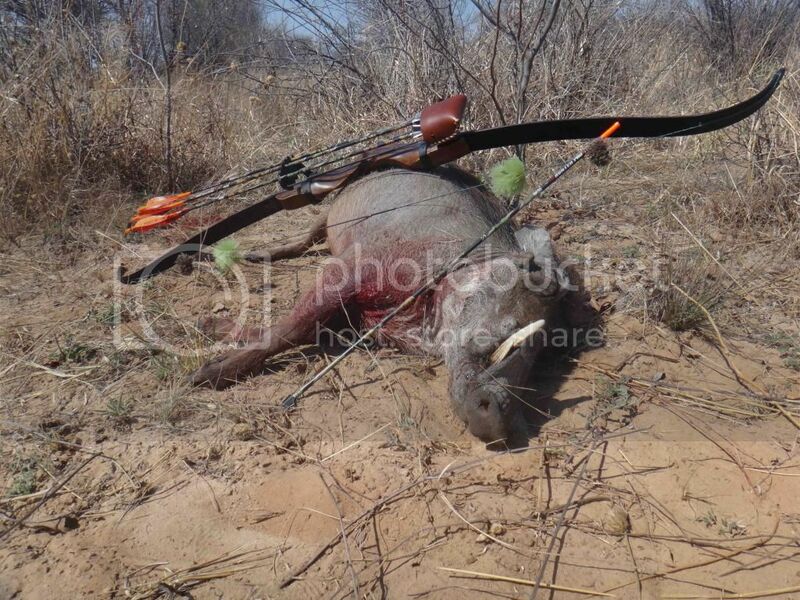 Next day in another nice blind, a young warthog came at 2 :00 PM, 22 yards away. It has been a boring morning and we decided to have some action. These animals in that place drink for a couple of minutes then flip and stop hearing for a few second then start to walk away quickly. Window shot is on that flip and stop moment. 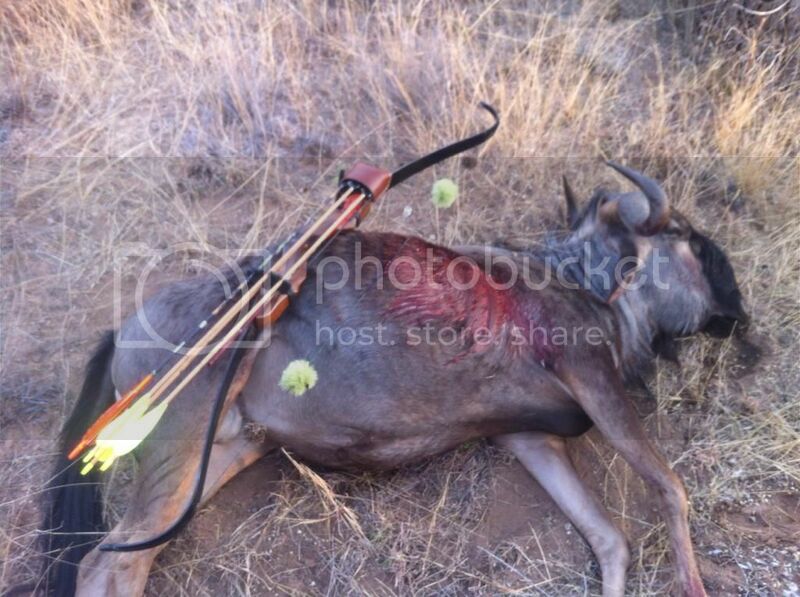 The arrow flew like a laser to the heart and the warthog ran even faster after the arrow passing him. Indeed it was an easy trail with heavy bleeding on the ground. That little brave beast made 100 yards with an 1.5" hole in the heart ! Time is going fast and day 5 came. I decided to give another try to the " oryx" pit blind where I shot the nice bull. We were really boring all the morning then at noon time a few warthog sows and kudu cows came. Then another depressing afternoon up to 5:00 pm. 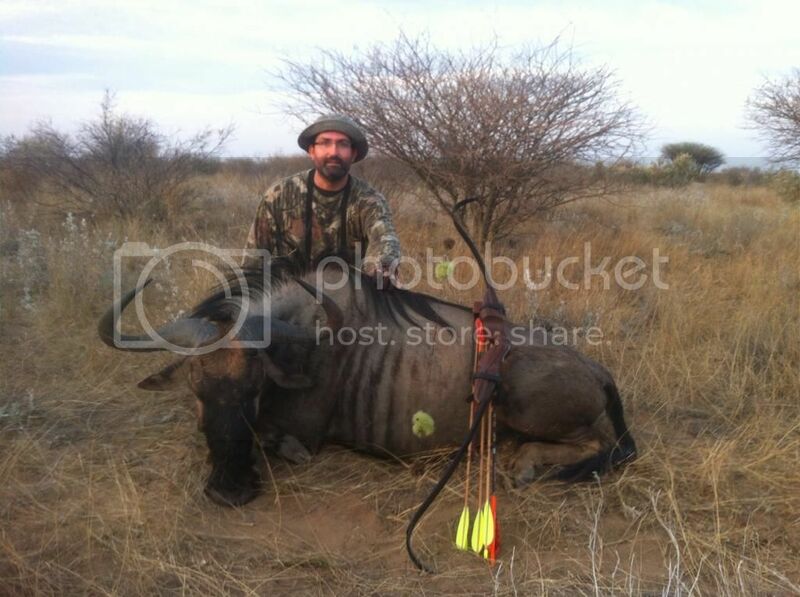 A small herd of wildebeest came with a bigger bull. All the herd was stepping inside the waterhole randomly moving. For 2 or 3 minutes I couldn't get any angle to the biggest bull at the back of the herd. Then things went quieter and a narrow window in the middle of the necks, shoulders and rumps of other wildebeest appeared. I was seeing properly a basket ball sized area on the broadsided chest, including shoulder crease. All the herd exploded, and my PH didn't understood which one I shot as he was watching with a different view angle. I perfectly followed mine after the shot and saw him disappearing in the bush a 100 yards away. We trailed him from the first blood, with small spotting for 50 yards and then massive one for a 100 yards. We found our dead bull laying. Arrow didn't pass through though. Hard earned animal !! Furthest part of water was 31 yards. Wind was good. We came at 7:00 AM and it was very cold : 46 degrees. 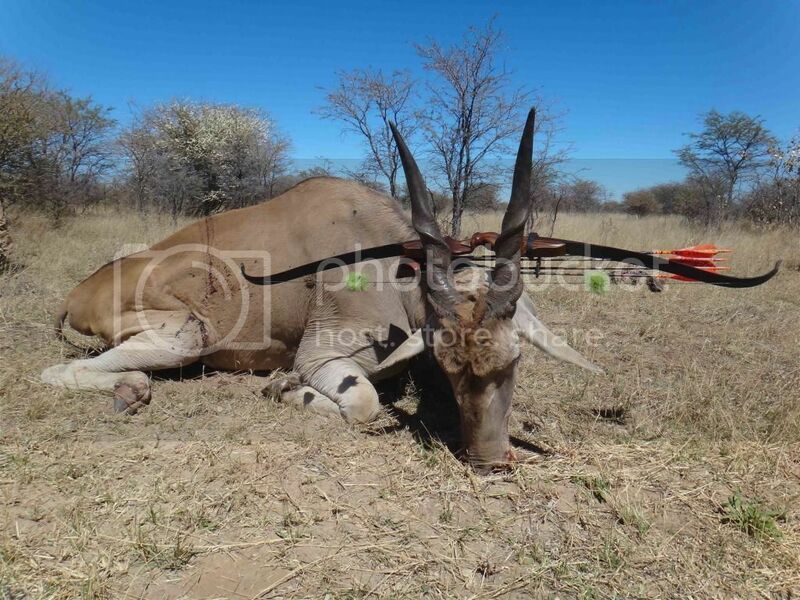 After only 45 minutes a magnificent kudu bull came, very old, a tad under 54". This old bull had a giant body and thick horn's base. Then he walked again slowly and all I could see in my binocs was the horn moving away... Man, that was weird ! Then I saw the horns shaking and the bull went down stone dead !! That moment was fantastic. Then came the last day. We decided to hunt out of the hide all the day. Now the hard time is starting for us. We are on his tracks, the faster we can, almost running slowly. After an hour we have a contact with a small herd of wildebeest and the PH locates the bull laying in the middle of the gnus a hundred yards from us. Damned! It is a BIG bull ! We try to sneak on the animals but wildebeest are spooky and wind not too good for us. Another run...that time the bull runs away less faster but enough to disappear. Another 30 minutes fast tracking for a new contact...this time I locate the bull before the crew. He is under a tree shadow standing. Another sneak up to 50 yards and then another run....that moment we all are getting tired and very thirsty with noon sun...they ask me if I am ok to go on? OF COURSE I'm Ok ! Man, I am suffering for more than 2 hours but I want this bull. Another couple of run and contact and now the bull can't run anymore. We are tracking almost running after him for almost four hours now. I am almost done. We have permanent contact to the bull 100 yards away, but can't outrun him yet. We decide to run and get closer, 50 yards. I can't run anymore faster and my PH 28 years old keep contact for half a mile after me. I keep on trails walking as fast as I can and soon jack is again with me. We find Richard completely done under a tree, out of breath. New track....but last ! Congrats I always like your stories. Another 30 minutes later contact with the bull walking. I am now under adrenalin only. Richard ask Jack to try to outrun the bull and try to make him to go back. 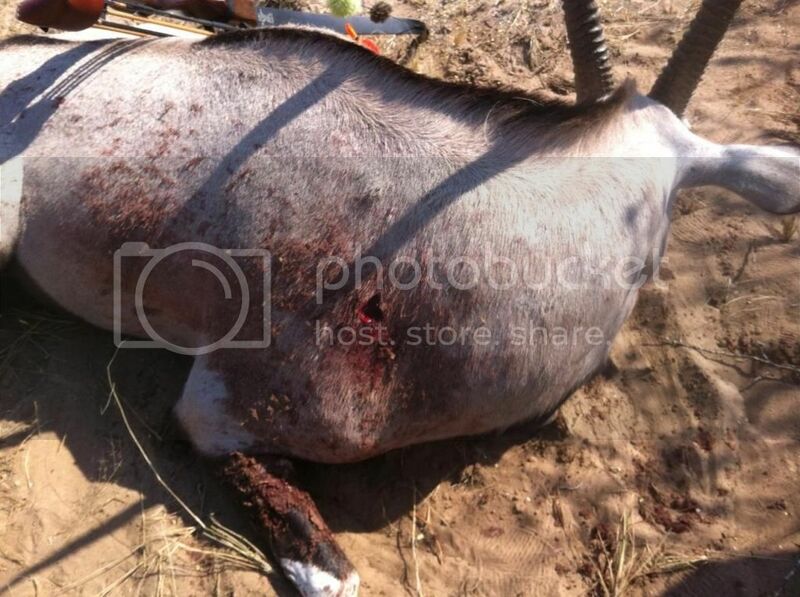 Just the time to see the bull falling dead on a sand road 80 yards away ! Many thanks to those who read me! Way to go! That must have been exciting! Looks like you got great penetration with those VPA/Big Jim's 3 Blades. 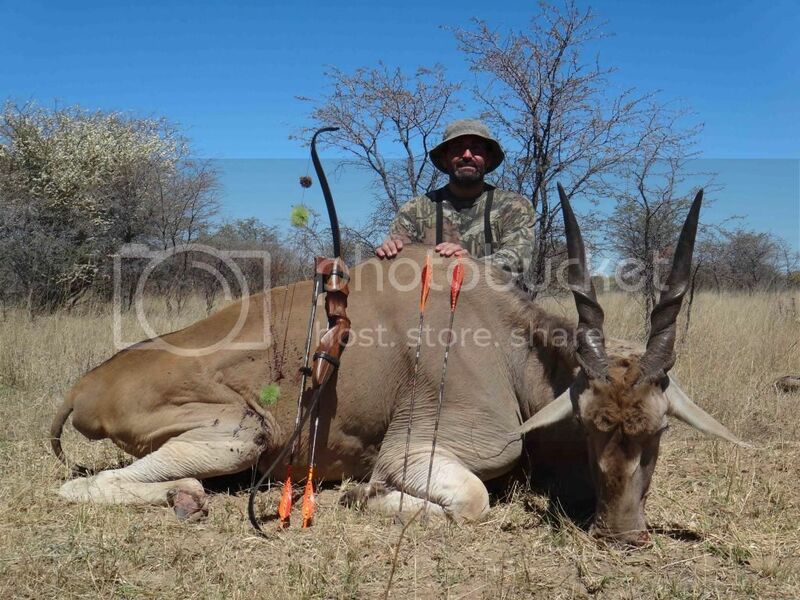 Great Story and PLEASE tell me you were able to try some of that Eland! It was by far the best tasting meat I've ever had!!! Congrat's on a a GREAT hunt!!! Wow! !That was quite a hunt. Thanks for sharing. Merci beaucoup, Laurent. The bushman way. I love that! Great hunting report. 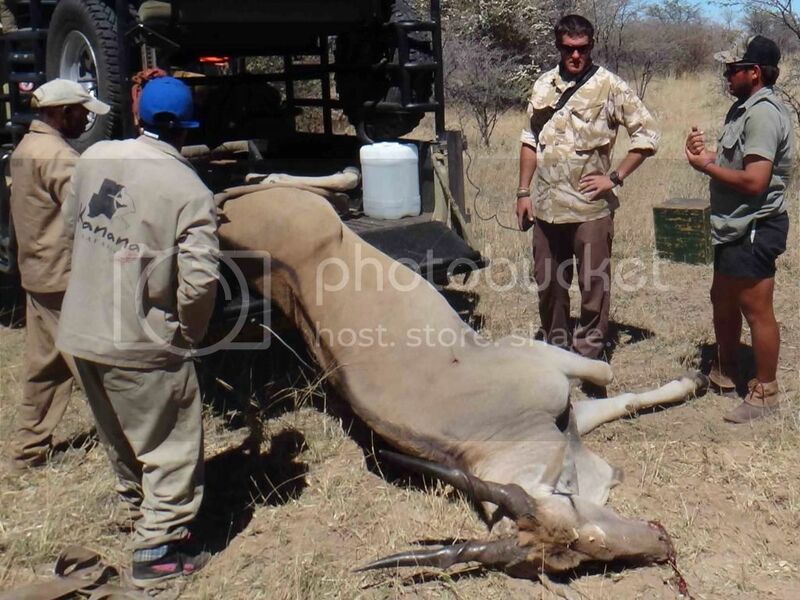 Your eland story is one of the most exciting hunting stories I've ever read.